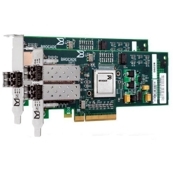 The Brocade 8Gb FC Single-port and Dual-port HBA for IBM System x are PCI Express 2.0 x8 8Gb Fibre Channel adapters with SFP+ LC-style connectors. The adapters connect to SFP+ Multimode Fiber SR optical modules. These adapters support 8 Gbps per port maximum bidirectional throughput for high-bandwidth storage (SAN). The PCI Express low profile form factor adapter can be used in either a standard PCI Express slot or a low profile PCI Express slot.